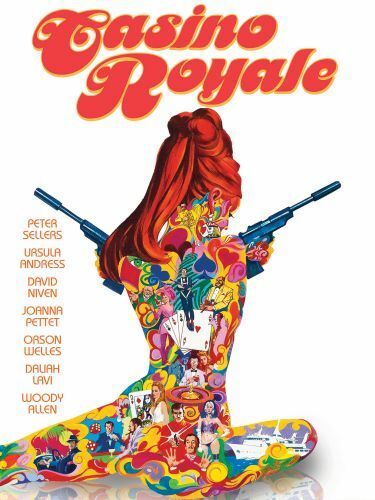 Casino Royale is the original ultimate spy spoof, setting the precedent for the Austin Powers movies of the late '90s. The presence of five directors coupled with the overly complicated plot makes the movie nearly impossible to follow. A satire to the highest degree, this was the first unofficial James Bond movie, but its unnecessary to compare it to any other Bond movies because it is such a hideous, zany disaster. The celebrity cast -- including big talents like Orson Welles, Peter Sellers, and Woody Allen -- is embarrassingly involved in ridiculous gag after ridiculous gag. For the theatrical release, the movie even used an appropriately silly marketing campaign that developed into "The Casino Royale Fun Movement," complete with promotional buttons reading slogans from the movie. Besides these classic pop-art images, Casino Royale is most valuable for its musical score, featuring Burt Bacharach, Herb Albert, and Dusty Springfield. The wacky kazoos and harpsichord arrangements, along with the pop gem "The Look of Love," are the perfect accompaniment to the vibrant images in this bizarrely constructed mess of a movie. Completely incoherent, Casino Royale remains a psychedelic, absurd masterpiece.